Starbucks Via is one of the best lightweight choices for backpackers. The Tagline: "Finally, a decent instant coffee"
The Starbucks Via Instant Brew Coffee is a decent cup of joe and in the dreadful world of instant coffee this is high praise. It is what it is of course, and it is instant coffee, but its the best there is without dragging a french press up the side of a mountain. "Just give me a decent cup of coffee!" I would always say after trying, and finding myself dissatisfied with yet another cup of instant coffee. Now I have my answer. 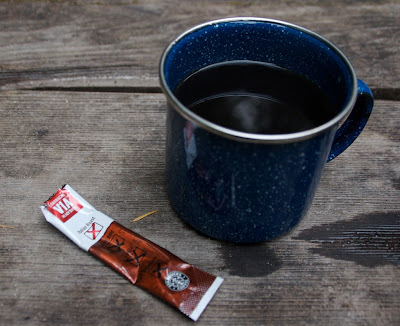 Naturally a coffee snob will not be satisfied by merely a "satisfactory" blend but for the average coffee drinker who can appreciate a good cup of coffee but can also swallow regular Starbucks coffee the VIA Instant Brew does okay. It isn't explosive with flavor and it won't trigger a religious experience, but, it's decent and its easy. It isn't cheap though, at about 83 cents for an 8oz cup it's probably the most expensive instant ground on the market. Of course it would also take awhile for that titanium backpacking french press to pay for itself even with the high price. In the backpacking world where just add water is the only practical option, Starbucks Via is at the top of the pile. "It isn't explosive with flavor and it won't trigger a religious experience..."
I think the take home point is that it isn't bad either. I wouldn't drink it on a regular basis, but for camping it's great.